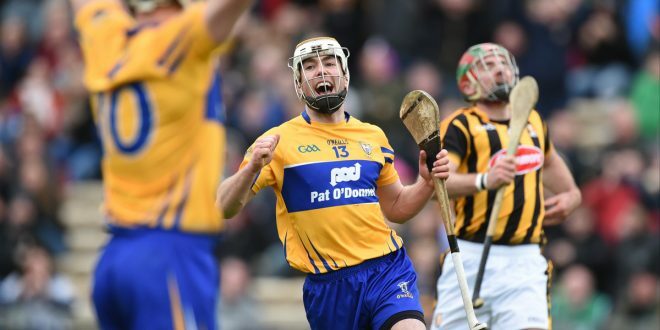 Conor Mc Grath of Clare celebrates his goal for Clare during their National Hurling League semi-final against Kilkenny at Thurles. Photograph by John Kelly. No, it’s not a mistake. Clare scored 4-22 on their way to a comprehensive win over hot favourites Kilkenny in the semi-final of the Allianz hurling league at Semple stadium in Thurles this Sunday afternoon and they were fully deserving winners on the day. 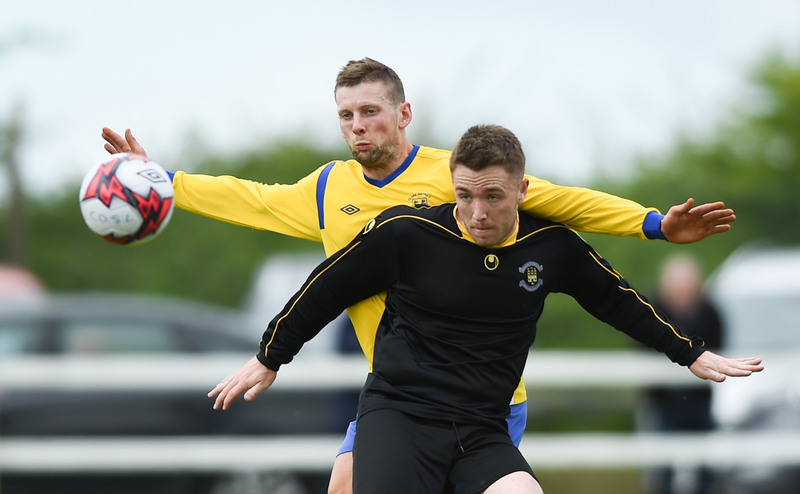 Three first half goals rocked the Noresiders who simply could not handle John Conlon in front of goal. Adding to the celebrations for the Clare fans was the return after a two year absence of Podge Collins and the return from injury of Tony Kelly, both of whom made valuable contributions on a day when theyre were many Clare stars. There were few people, certainly outside the Clare camp, that would have predicted an eleven point half time lead for the Banner side but that was the position with Clare 3-12 to 0-10 in front when the half time whistle sounded. That they were fully deserving to be in that position is without question as they had dominated the exchanges and caused all sorts of problems for the Kilkenny defence in the process. After the teams had exchanged points, Clare hit four without reply to lead by four after eleven minutes. It eas 0-6 to 0-3 when, after fifteen minutes, the Banner men struck for the game’s first goal, Conlon one handed first timing to the net after full back Joey Holden and goalkeeper Eoin Murphy had failed to deal with a high delivery fromm Colm Galvin. Goal number two followed five minutes later, Aaron cunningham shooting low to the corner of the net and the Shannon man struck again after another five minutes when the Kilkenny defence again failed to deal with a high delivery, this time from David Fitzgerald. Kilkenny piled on the pressure on the resumption and a goal from a T.J.Reid 20m free he;ped them to reduce Clare’s lead to seven points by the thirteenth minute. Two minutes later they were rocked by an outstanding goal from Conor McGrath who had a superb outing, contributing 1-6 of his side’s tally..
At this point Clar eintroduced Tony Kelly and with his first touch he scored a superb point and quickly followed with another, scores that helped kill the Kilkenny challenge. **In the opening game on the Semple stadium programme, Waterford, Clare’s opponents inthe Munster semi-final on June 5, proved too strong for Limerick, winning on a soreline of 3-23 to 1-18. The sides will meet in the decider in two weeks time. Clare; Pat Kelly; Oisin O’Brien, Cian Dillon, Paul Flanagan; Conor Cleary, Brendan Bugler, Pat O’Connor; David Reidy, Colm Galvin; John Conlon, Podge Collins, Aaron Cunningham, David Fitzgerald, Darach Honan, Conor McGrath.